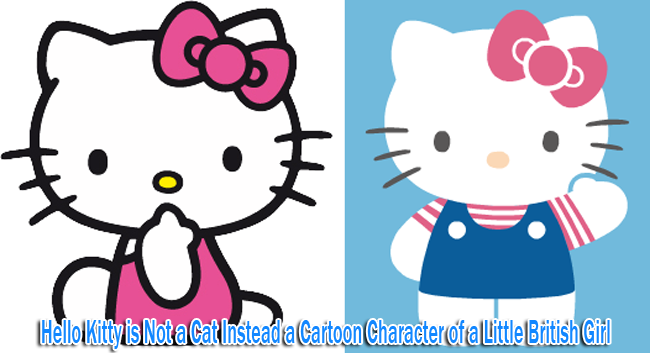 Netizens were shocked when their childhood known character “Hello Kitty” turned out not what she seemed to be. Hello Kitty is actually a little British girl. Commonly depicted as a cat without a mouth and with a red ribbon on her head, Sanrio’s creation succeeded to be a household name. Who doesn't know Hello Kitty? She created the pink craze all over the globe. People had gone to different places to novelty items that are connected to this famous character, so when the news came out about her true identity, it became the talk not just of the town but also on the world wide web. According to Christine R. Yano, a anthropologist, she was corrected by the Sanrio when she called Hello Kitty a cat. As it turned out, her real name is Kitty White and she lives in the suburbs of London with her parents, Mary and George, and Mimi, her twin sister. Her birthday is November 1, as tall as five apples and as heavy as three apples. Her blood type is A, the same initial letter of her favorite fruit, apple. She is not a cat, but she does have a cat named Charmy Kitty given by her dad. She even has a pet hamster named Sugar. She walks with her two feet and does things like any normal human being. She also has lots of friends, like her childhood friend Dear Daniel, Tracy and Fifi, because she thinks that you can never have too many friends. Indeed Hello Kitty is a Japanese icon, but why is she British, you say? In the years of 1970, the same year she was introduced to public, Japanese are interested with Britain.